The data generated is primary in nature. Data has been collected through survey questionnaires containing both structured and unstructured questions. One set of questionnaires has been prepared. It was given to clients who are main service holder of Premium Banking Service in order to identify their satisfaction level. Convenient sampling method was adopted whereby most of the respondents available at Motijheeil Branch. A descriptive research under conclusive research was used to conduct this research because according to N.K. Malhotra (2003) a descriptive research is a type of conclusive research and it can e conducted to determine the perception of product or service characteristics. For the sake of simplicity and the reason of easy availability the study concentrated on existing Premium Banking clients only. The selection of the sample was random and size is 25. One set of questionnaire has been used to conduct an investigative research. Data analysis was mainly done through graphical presentation, frequency and percentage. Finally the implications of the analyzed data have been discussed in the result section. The gathered data was collected from the customers when they came for service at the Motijheeil branch of BRAC Bank and the questionnaire was provided to those customers who were interested in participating in the survey. After completing the survey the data was analyzed by Microsoft Excel. Then the findings were made. Based on the findings the present situation was explained and recommendation was made. BRAC Bank authority did not want to disclose all the information needed. Although the officers of the BRAC Bank Ltd. have been very helpful, they didn’t have enough time to provide, as they are very busy with their assigned works. So, in some cases, observation was needed. The survey was based on Premium Banking customers of Motijheel Branch only. BRAC Bank Limited, the fastest growing bank in Bangladesh has recently received ICMAB National Best Corporate Award 2007 for the criteria of its Capital Adequacy, Asset Quality, Profitability, Liquidity, Corporate Governance, Market Share, Contribution to National Economy, Risk Management, Regulatory Compliance, Disclosure, CSR in the category of “Financial Institutions”. One of the four sustainable SME banks in the world. Leader in SME financing through 368 offices. Biggest suit of personal banking & SME products. Large ATMs (Automated Teller Machine) & POS (Point of Sales) network. Building a profitable and socially responsible financial institution focused on Markets and Business with growth potential, thereby assisting BRAC and stakeholders build a just, enlightened, healthy, democratic and poverty free Bangladesh. Sustained growth in ‘Small & Medium Enterprise’ sector. Continuous low cost deposit growth with controlled growth in Retained Assets. Corporate Assets to be funded through self-liability mobilization. Growth in Assets through Syndications and Investment in faster growing sectors. Continuous endeavor to increase fee-based income Keep our Debt Charges at 2% to maintain a steady profitable growth. Achieve efficient synergies between the bank’s Branches, SME Unit Offices and BRAC field offices for delivery of Remittance and Bank’s other products and services. Manage various lines of business in a fully controlled environment with no compromise on service quality. Our Strength emanates from our owner – BRAC. This means, we will hold the following values and will be guided by them as we do our jobs. Value the fact that we are member of the BRAC family. Have a strong customer focus and build relationships based on integrity, superior service and mutual benefit. Work as a team to serve the best interest of our owners. Value and respect people and make decisions based on merit. ►To finance the industry, trade and commerce in both the conventional way and by offering customer friendly credit service. ►To encourage the new entrepreneurs for investment and thus to develop the country’s industry sector and contribute to the economic development. ►To develop the standard of living of the limited income group by providing Consumer Credit. ►To mobilize the savings and channeling it out as loan or advance as the company approve. ►To establish, maintain, carry on, transact and undertake all kinds of investment and financial business including underwriting, managing and distributing the issue of stocks, debentures, and other securities. Company Secretary & Head of Regulatory & Internal Control, Head of Impaired Assets Management, Manager-Complaint Handling Cell & Credit Inspector. 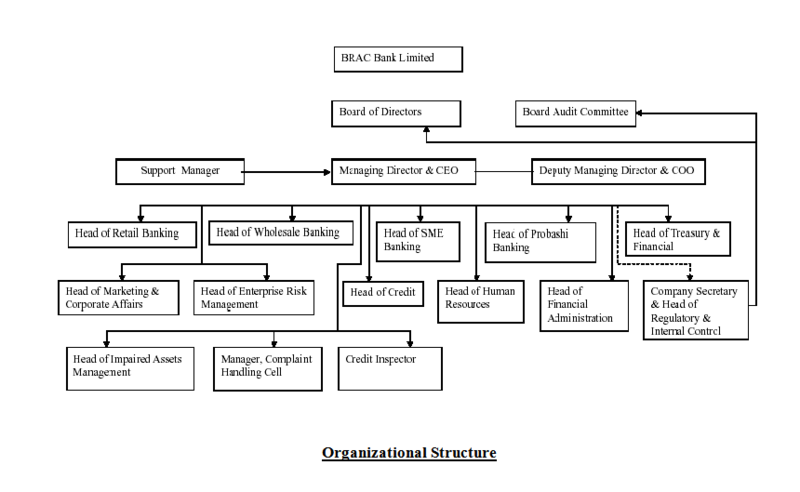 There is another part of the Organogram, which deals with the reporting line of Deputy Managing Director & COO. This line constitutes of the Heads of the Support Units. The Units are: Head of Retail Banking Operation, Head of Corporate Banking Operations, Head of SME Banking Operations, Head of Probashi Banking Operations, Senior Manager-Card Operations, Head of Business Solutions, Head of Technology, Head of General Infrastructure Services, Head of Central Operations, Senior Manager-Call Centre, Senior Manager, Project Admin, Service Quality, Operations Risk Mgt. & Operations MIS. Interest income for the period has increased by 71% because of increase of loan by 61% and investment income by 93% over previous year; because of change in investment mix and inclusion of long term nature BGTB at higher interest rates. These factors cause the significant increase in operating margin over previous year. Economic profit is a residual measurement, which subtracts the cost of capital from the net operating profits after tax generated in the business. The Bank’s internal performance measures include economic profit, a calculation that compares the return on the financial capital invested in the Bank by its immediate sponsors of the Bank with the cost of that capital. The Bank prices it’s cost of capital internally and the difference between that cost and post-tax profit attribute to the ordinary shareholders represents the amount of economic profit generated. The management as one of the measures to decide where to allocate resources so that they will be most productive uses economic profit. Total asset of the bank rose to BDT 46,382.59 million in 2007 from BDT 30,011.82 million in 2006 registering a growth of 54.55%. Significant increases in assets documented in loans and advances investments, fixed assets and cash assets maintained by the bank. Earnings per share stood at Tk. 54.95 as on December 31, 2007 compared to Tk. 29.38 at the end of previous year, which is restated because of issuance of bonus shares during the year. Table 1: Customers’ responses regarding question 1. Figure-1: Customers’ responses regarding question 1. From the frequency table and bar chat it can be said that the number of male clients is more than the female clients among the respondents. There were 21 males and only 4 females among the respondents, which means 84% of the respondent is male and 24 % are the female. Table-2: Customers’ responses regarding question 2. Figure-2: Customers’ responses regarding question 2. It can be said from the frequency chart that highest number of respondents are between the age group 30 to 40, which is 40%. The second highest is age group 40 to 60which is 36%. Age below 30 is 16% and the rest are from the oldest group of people ageing above 60 who are very few in numbers. Table-3: Customers’ responses regarding question 3. Figure-3: Customers’ responses regarding question 3. From the findings it can be said that most of the respondents have completed their Bachelor degree, which is 72%. Among the other respondents, 20% have completed Masters degree and the rest 8 % of the respondents have completed only H.S.C. None of the respondents were just S.S.C passed. Table-4: Customers’ responses regarding question 4. Figure-4: Customers’ responses regarding question 4. Among the 25 respondents 56% came from high-income level. 24% come from middle-income level (taka 50,000-100,000) and 12% come from high-mid income family (taka 30,000-50,000). The rest of the 8% are customers with low family income. This finding indicates most of the respondents are from high family income. Table-5: Customers’ responses regarding question 5. Figure-5: Customers’ responses regarding question 5. Respondents were asked about how long they are using this Premium Banking services of BRAC Bank Ltd. Result shows that highest number of respondents are using it for more than one year and the second highest is users ranging form 6 months to 1 year. 16% of the respondents are with the service for 1 to 6 months. Only 4% are new as the PB service holder. Table-6: Customers’ responses regarding question 6. Figure-6: Customers’ responses regarding question 6. Here, it shows that most of the respondents (68%) have come to know about the product and got encouraged by their relationship managers who work in the bank. Few numbers of respondents learned about this service from the bank’s brochure and company website. The least number of customers have found it from the website. Respondents were asked about the quality of service that PB of BRAC Bank is providing. Their responses to the answer are given in the following frequency table. Figure-7: Customers’ responses regarding question 7. 36% respondents agree that sometimes PB provides quality service. 20% of the respondents strongly agree with the statement and 16% were neutral about it. There was 24% negative attitude or disagreement about the statement among the respondents. Table-8: Customers’ responses regarding question 8. Figure-8: Customers’ responses regarding question 8. As we can see that 76% of the respondents have supported the statement, which can be taken as a positive side of the service. 12% of the respondents think relationship mangers are sometimes helpful. 2% of the respondents were neutral about the question and only 4% customers think that they are never getting the service. Question no. 9 in the questionnaire tries to find out the credit card facility provided for PB clients. This was an unstructured question that asked the respondents about dissatisfactions (if any) faced by credit card facility. It was an open ended question where the customer can write their problems. Figure-9: Customers’ responses regarding question 9. 16 % of the respondents were very satisfied with the credit card facility. Only one respondent were neural about the question, which is 20%. Most of the respondents said that they are not that much satisfied which is 12%. And 68% of the customers were dissatisfied with the credit card facility. Reason they mentioned is that bank often deducts credit card charges and sends them credit card bills though as a PB client they are supposed to get 50% waver from these charges. Customers consider this as a big hassle for them as it is sometimes time consuming, as they need to wait for banks verification and other procedures. Table-10: Customers’ responses regarding question 10. Figure-10: Customers’ responses regarding question 10. From the frequency table and the bar chart we can say most of the respondents went with the option “all of the above” which is 72%. Among the other respondents, 12% agrees that they have signed up for Premium Banking because it provides quality service, 8% says it is very much secured and another 8% says because relationship managers are very helpful. So we can conclude with saying that respondents signed up for this service because of all the services Premium Banking provides to its clients, which means the respondent’s perception regarding this statement is good. Table-11: Customers’ responses regarding question 11. Figure-11: Customers’ responses regarding question 11. Most of the respondents agree that they would recommend this service to others, which is 60%. 20% said they might recommend this service to others. 12% said not at all and only 8% said never. From this response it can be determined that most of the respondents are more or less happy with the existing service, that’s why we can see that most of the people agrees with the statement and only a few number of respondents disagree. Figure-12: Customers’ responses regarding question12. From the above frequency table and the bar chart it can be determined that the 32% of the respondents are completely satisfied with the BRAC Bank’s Premium Banking service. About 32% agrees with the option somewhat satisfied. 12% of the respondents were neither satisfied nor dissatisfied and 24% of the respondents were completely dissatisfied. This is a positive aspect, as the percentage of dissatisfied customers seemed to be lower then percentage of satisfied customers among the respondents. I am a student of AIUB is currently conducting my intern report on ‘The satisfaction level of BRAC Bank’s Premium Banking Service among the premium client segment’. It would be highly appreciated if you provide us information in this regard and we assure you that all the data will be kept confidential and will be used only for academic purpose. Please mention your family income from the options given below? For how long you are using the Premium Banking services of BRAC Bank Ltd? 6. How did you find out about this PB service at first? 7. Do BRAC Bank Premium Banking provides quality services? 8. Do you think All Relationship managers are knowledgeable of their customers and they are very helpful? 9. Do you think the credit card facility provided for Premium Banking clients is satisfactory? If not then please specify the problem in the blank space. 11. Would you recommend PB service to other people? 12. Please state your satisfaction level regarding the Premium Banking service of BRAC Bank.